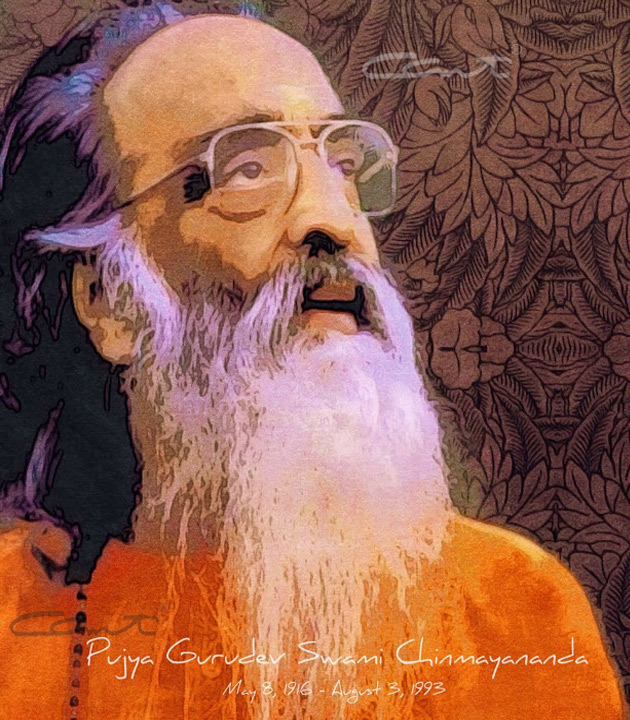 Swami Chinmayananda, known as Pujya Gurudev in Chinmaya Mission, needs no introduction to spiritual seekers. His name is synonymous with the renaissance of Bhagavad Gita in modern times. The main goal of his life was to reach the knowledge and wisdom of the ancient Hindu scriptures to the common person in everyday life. He felt that this was essential for the revival and preservation of Bharatiya culture, ensuring a harmonious and peaceful way of life, enriched with spiritual values. The Chinmaya Mission was established in August 8, 1953 in Chennai. Today, the Central Chinmaya Mission Trust has its headquarters in Powai, Mumbai. The Sandeepany Sadhanalayas offer full-fledged two-year Vedanta Courses. This prepares many acharyas to conduct jnana yajnas. The grass root activities are Balavihar for children, Chinmaya Yuva Kendras for youth, Study Groups for adults, Devi Groups for women and Chinmaya Vanaprastha Sansthan for senior citizens. There are temples and ashrams spread all over the world. In the educational field, Chinmaya Vidyalayas play a major part, besides the Chinmaya International Foundation that concentrates on Indological studies and the recently established deemed university named Chinmaya Vishwavidyapeeth. For more details, please visit the Chinmaya Mission website. L To R: Padmini, Balan (Swami Chinmayananda), Kuttan Menon, Kanakam. Parukutty Amma was Balakrishna Menon's mother. 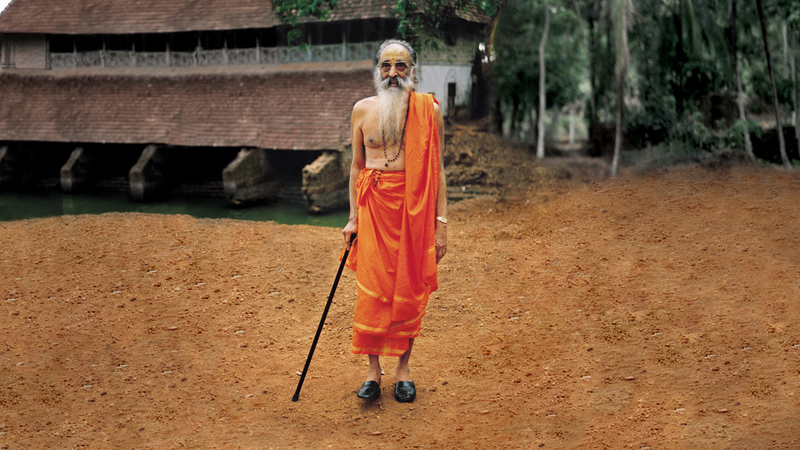 Swami Chinmayananda was born as Balakrishna Menon in a well-to-do Malayalam family in Ernakulam in the year 1916. Parukutty Amma, who gave birth to him, passed away by the time he was five years old. He was brought up in Poothampalli House, in the joint matriarchal family, by his aunt Kochu Narayani Amma. He had two sisters, Padmini and Kanakam. His bonding with Kochu Amma was so deep that he kept in touch with her and served her personally through the years. Her son Bhaskara Menon also played a very significant role in his life. Later, his father Sri Kuttan Menon married Devaki and they had four children – P. Unni Menon, Malathi, Vijayalakshmi and Vimala, all of whom looked up to Swamiji with love and respect. The family tradition of evening prayers left a deep impact on him during his childhood. He recounts this in detail in an interview that was published in the Champion magazine in December 1949. The scan of the original publication is available here and is a must read! Balakrishna Menon received his primary education in Sri Rama Varma High School in Ernakulam. He then moved to Vivekodayam Boys’ High School in Thrissur. He grew up to be a bright and smart young man, fond of dressing well. He loved playing tennis and swimming. He completed his undergraduate studies in St. Thomas College in Thrissur and then joined the Lucknow University for a double degree – M. A. and LLB. He completed his M. A. Around this time, he was drawn towards the freedom movement, became actively involved in it, was arrested, and spent some months in jail. On his release, he spent nearly six months in Baroda, with his cousin Achyuta Menon till he recuperated completely. He then returned to Lucknow and tried to pick up the threads of his life. He trained as a journalist under K. Rama Rao, the editor of National Herald, and published a series of articles on miscellaneous topics. Later, he became a freelance journalist. Having had a taste of the best of high society, he was disillusioned and wondered at the meaninglessness of such life. Around this time, the death of his close friend Narendra Shroff shook him deeply and he sought a higher purpose in life. A visit to meet Swami Sivananda Maharaj in his ashram at Rishikesh proved to be the turning point of his life. Admiration and involvement culminated in his sannyasa diksha on Sivaratri Day in 1949. Swami Sivananda gave him the name Swami Chinmayananda and later sent him to Swami Tapovanam in Uttarkashi for deeper scriptural studies. Intense study and extreme austerity characterised his days with Swami Tapovan Maharaj. The alchemy was something beyond words. They moved to Gangotri in the summer months and reached the pinnacle of the study of the Upanishads in the Himalayan heights, at the very source of the holy River Ganga. Charged with the supreme knowledge of the Self, Chinmaya wanted to share it with the whole world. Inspired by Mother Ganga who flows through the plains to nourish mankind before she merges into the ocean, he decided to dedicate his life to the dissemination of this divine knowledge. Blessed by both his Gurus, he prepared to launch the programme of jnana yajnas that would be his life-long mission. The traditional concept of a yajna as a joint sacrificial endeavour for the welfare of the society is explained in the Bhagavad Gita. Pujya Gurudev Swami Chinmayananda took it to a higher level, where people poured forth their contributions in terms of time, effort and money to organise a jnana yajna, a series of talks on the Upanishads and the Bhagavad Gita, which would kindle and set ablaze the fire of knowledge. Thus the supreme knowledge of the Self was made freely available to everyone. The first jnana yajna that he conducted was in the Ganesh Temple in Rasthapet, Pune, from December 31, 1951 to April 8, 1952. This was followed by similar jnana yajnas in Madras (now Chennai) and Delhi. In course of time, he polished the whole process and evolved a very effective means of communicating the message of the Upanishads through a series of talks. The duration of the yajnas came down to a fortnight, and then to ten days and a week. By 1955 he started giving talks on the Bhagavad Gita. In the later years, the evening talks were on the Gita and the morning talks to a more select audience on the Upanishads. Pujya Gurudev conducted more than 500 jnana yajnas in India and abroad. Pujya Gurudev had developed a heart problem as early as 1970. But he continued to work and poured forth his best through the years. Whenever rest was necessitated, he would go into retreat, generally at Uttarkashi, but even that time would be devoted to writing and preparing books for publication. By the early nineties, his health deteriorated, and doctors marvelled at the energetic discourses in spite of a failing heart. In July 1993, he flew to Chicago as per his itinerary and conducted a jnana yajna there. Next, he conducted a camp in Krishnalaya, Piercy and then in Washington DC as per schedule. There he was taken ill. Nonetheless, he flew to San Diego en route to Los Angeles, but he had to be hospitalised, as his condition worsened. Pujya Gurudev attained Mahasamadhi on August 3, 1993 at San Diego, USA. The mortal remains were flown back to India and a grand bhu-samadhi was organised in the Sidhbari ashram. Devotees flocked from all over the world for a final darshan of their beloved master. And in Sidhbari he rests to this day in the picturesque Samadhi Mandir, with the splendid background of the snow-covered Dhauladhar peaks that he loved so much.